Your tongue helps you talk, taste and manipulate food in your mouth, but it doesn't help you much getting food to it. For some members of the animal kingdom, though, the tongue is a highly adapted muscle critical for life. Without it, some creatures couldn't eat even with food all around them. Various herbivores, carnivores and insectivores are among these. Their tongues vary in size, shape and range of motion, depending primarily on diet. 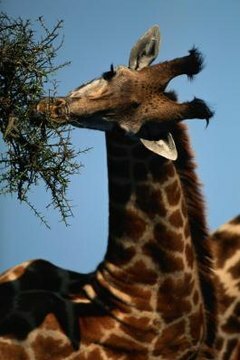 Giraffes spend most of their waking hours munching on their favorite source of sustenance, the leaves of the acacia tree. The thorns that project from the base of the tree's leafstalks, or petioles, dissuade most other animals from consuming them. Giraffes, however, are able to bypass the thorns with the help of their 18-inch tongues. Viscous saliva protects giraffes' tongues and digestive tracts from thorns that make it to their mouths. In aardvarks and giant anteaters, found in Africa and Central and South America, respectively, the tongue is a tool for extracting burrowing insects from the ground. Aardvarks use their foot-long tongues to probe into termite mounds. Toothless giant anteaters, whose tongues can be 2 feet long, employ a similar strategy for unearthing both termites and ants. Affixed to the tongue of every alligator snapping turtle (Macrochelys temminckii) is a red appendage that, to the eyes of a fish or a frog, looks very much like a worm. The large freshwater turtle, found in the southeastern United States, captures prey by remaining still at the bottom of a river or stream and closing his jaws on any fish or amphibian that approaches his built-in lure. The chameleon would have a hard time securing a meal if the creature had to chase his swift insect prey. Instead, the chameleon reaches crickets and grasshoppers with his unfathomably long tongue, which has a suction action at the tip and can extend twice the length of the lizard's body in less than a second. It takes fractions of a second for the giant palm salamander's tongue, which has the most powerful thrust of any muscle in the animal kingdom, to shoot out from the animal's mouth like an arrow from a bow. The combination of strength, speed and a sticky patch at the tip of the tongue enables this Central American salamander, which is only a few inches long, to catch speedy insects. The frog's tongue is attached to the mouth at the front rather than at the back. In under a second, the frog captures and swallows an insect by flipping his sticky tongue forward and flinging his catch into his throat. When the frog is not feeding, the creature keeps his tongue curled inside his mouth. The woodpecker is known for using his tough bill to penetrate the surface of tree trunks and uncover the insects that live in the nooks and crannies below. The woodpecker's tongue is just as important; however; it is covered in tacky saliva that allows the bird to extract his prey from the bark. In some species, the tongue is stored in a "pocket" between the between the bird's skin and skull that wraps around the head. The hummingbird, which feeds on nectar, uses her two-pronged tongue to access the sugary liquid inside flowers. Fibers that project from the edges of each "prong" absorb nectar through capillary action -- the same phenomenon that allows plants to draw water up from the ground in spite of gravity. Why Do Frogs Close Their Eyes While Eating?